The average salary for a dental hygienist in the United States is around $61,047 per year. This is 5% above the national average. ● Updated in 2017. Dental hygienists earn an average yearly salary of $61,047. Wages typically start from $52,535 and go up to $92,461. How much does a dental hygienist make in the United States? How much does a Dental Hygienist earn? Dental hygienists enjoy a comfortable salary and a number of benefits, considering that half of them work part-time. In 2014, their median salary was $71,520. The best-paid earned about $97,390, and the bottom 10 percent earned $49,190. 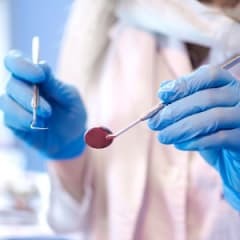 The top-paying industry for dental hygienists, according to the US Department of Labor, was ambulatory healthcare service providers where dental hygienists earned an annual, average salary of $83,360 per year. Base hourly plus commission: This guarantees dental hygienists a minimum salary, while also providing them with incentive for efficient production. Straight Commission: Dental hygienists may be put in a financially risky situation, particularly in a new practice or one that is not always busy. However, dental hygienists may earn about 33 percent of total hygiene production, thereby opening up the door for a higher salary than those paid a straight hourly salary. Hourly plus bonus system: Bonuses for dental hygienists are commonplace, and many dentists use them as incentives for efficient production. Bonuses often equal between 10 and 20 percent of total services performed and billed for. Dental hygienist salaries in the United States also vary slightly according to geographical location. District of Columbia’s dental hygienists earn the highest average salary at $93,940, followed closely by California’s dental hygienists who earn an average of $93,920, and Washington State’s dental hygienists who earn $92,610 on average. The state of California tends to compensate their dental hygienists particularly well, especially in the metropolitan areas of San Francisco and Sacramento. The highest paid in the dental hygienist profession work in the metropolitan areas of San Francisco, Sacramento, California, and Corvallis, Oregon. The Mount Vernon, Washington area also pays well, as does the city of Santa Cruz, California. How do dental hygienist salaries compare to similar careers? Dental hygienists earn about the same as related careers in the United States. On average, they make less than clinical nurse specialists but more than healthcare social workers.